Trail 96.5 mm / 3.8"
Wheelbase 1397 mm / 55"
Seat Height 749 mm / 29.5"
Ride the Thunderbolt! That is the only way to understand this motorcycle. I had looked at Buell motorcycles, especially the top of the line S3 Thunderbolt, almost every time I visited my local Harley-Davidson dealer, but I never understood these motorcycles until I finally took a test ride. That is what the Buell motorcycles are all about: the ride. There are fancier, plainer, costlier, cheaper, prettier, homelier, faster, slower, lighter, heavier, bigger, and smaller motorcycles available, but in all my years of riding I have never ridden anything like a Buell. That also seems to be the opinion of the Buell owners I have talked to, including those who have owned a variety of expensive (read Italian) sport bikes. Speaking of which, Harley's investment in Buell appears to be paying off. Last year (1998), Buell outsold all of the other "specialty sport bikes" (a term which, I believe, excludes the regular production of the Japanese Big Four) in the U.S. except Ducati, who managed to stay in first place by the slimmest of margins. This year, Buell expects to outsell Ducati and take over the number one spot. As I write this, in 1999, the Buell line of Vee-twin sport bikes consists of three models. There is the surprisingly economical M2 Cyclone, the X1 Lightning street fighter, and the sport or sport-touring oriented S3 Thunderbolt. All exhibit similar, but not identical, styling and performance, and all three are powered by a modified Harley-Davidson Sportster 1200 motor. All three are sporty motorcycles designed to get you off the line and down the road quickly, with the maximum amount of fun. Real world performance is the forte' of these bikes, and not much can catch them on the road. Like all Buells, but unlike most other sport and sport-touring bikes, the engine of the S3 is left open to view. There is no bodywork to hide that big powerplant. The visible V-twin motor is probably the easiest way to identify a Buell American Motorcycle. In a world of look-alike sport bikes, nothing else looks like a Buell. Because I am a fan of the sport-touring concept, the Thunderbolt S3T is the Buell for me. All Thunderbolts feature a frame mounted sport fairing designed to protect the rider and gas tank (without obscuring the motor), You get to pick from a variety of color combinations for the Thunderbolt. My favorite color scheme for 1999 is the "Molten Orange" (fairing,tank, and tail section) with "Nuclear Blue" (frame and wheels) color scheme. Hey, there's safety in conspicuity! I recommend the S3T touring package. This includes touring handlebars, fairing lowers, two fitted soft storage bags for the fairing, an underseat tote bag (perfect for a toolkit, and not much else), and the newly improved, color coordinated, detachable, hard saddlebags, which come with fitted removable liners. The saddle bags come with your choice of deep (read bulky) or narrow (read trim) covers. Although the deep covers will swallow a full face helmet, I prefer the sleeker and more attractive narrow covers, a triumph of form over function. The other covers can be ordered separately later, if it becomes necessary. I don't have much use for the color matched fairing lowers, included in the S3T touring package, because they trap even more of the already excessive heat generated by the big 74 cubic inch engine throbbing within inches of the rider's legs, and detract from the bike's appearance. Also, they are fairly flimsy (the body parts of these bikes are designed to be light in weight) and stick out to the sides, and are therefore liable to damage if the bike falls over in a parking lot mishap (or something similar). Fortunately, they are designed to be easily removed. Two options available only from the aftermarket (as I write this) are a taller "touring" windshield, and thicker, softer, gel handgrips (is anybody at Buell taking notes?). Buell does offer an excellent tank bag, which I recommend. The result is a sport-touring bike from the sporty end of the spectrum. Other neat features of the Thunderbolt include a chrome-moly tubular perimeter frame, digital electronic fuel injection (which eliminates the hassle of a fuel tank petcock, as well as a choke), hydraulic self-adjusting valve lifters, electronic ignition, belt drive, stainless steel header pipes, fully adjustable suspension with inverted front forks and a rear mono shock which operates in extension, aluminum arc swingarm, hollow 3-spoke cast wheels, "Z" rated radial tubeless tires, superb brakes, completely sealed maintenance-free battery, halogen headlight with an adjustment knob in the fairing, excellent fairing mounted mirrors (you actually see the traffic behind you, instead of your arms), European passing lamp flasher (a little trigger on the left handlebar controls that flashes the high beam), and folding footpegs. About all that is missing is self-canceling turn signals (Dear Buell representative: please note). All 1999 Buells come with a much improved dual seat, and I am happy to report that the new, wide, Thunderbolt seat is adequately comfortable for solo commuting and Sunday rides. I have not taken any long trips, so I cannot comment on its suitability for serious touring. A drawback to the wider seat is that it is a longer reach to the ground than it used to be from the old, uncomfortable but narrower, version. The factory specification says the seat height is 29.5 inches, but they must have measured it with the suspension at both ends set to the lowest possible setting, and the tires flat. It feels higher than that. The Thunderbolt would not be my first choice, given my 30 inch inseam, for a lot of complicated parking lot maneuvers. Nor is it a particularly good bike for riding with a passenger. The bike is somewhat top heavy to start with, and this top heavy feeling is aggrivated by a seat that puts the passenger too high and too far back. If you ride two up a lot, a Buell may not be the bike for you. After mentioning the new seat, I should mention that I find the rider's seating position quite comfortable. An average size rider is postioned in a relaxed position with a slight froward lean. It is better, in my opinion, than the seating position on a BMW R 1100RS sport-tourer, or a Triumph Thunderbird Sport (bikes with which it might reasonably be compared). The location of the rider's footpegs, in particular, is very good. So is the height and reach of the touring handlebar. The layout of the handlebar controls and switches is conventional, and easy to learn. Mounted in the dash are a large tach and speedo, plus a surprisingly useful quartz clock. Also on the dash are a variety of idiot lights, including a handy low fuel warning light which illuminates when .4 gallon of petrol remains. The large 5.4 gallon fuel tank means 225-265 miles (on average) before the low fuel warning light comes on. This is outstanding range, greater than that offered by most luxury touring bikes. On a recent 205 mile Saturday ride from Eugene to Sisters and back, involving both the old and new Mckenzie Highways over Oregon's Cascade Mountains, I actually averaged 59.94 miles per gallon. That would mean approximately 300 miles from a full tank of gas before the low fuel light comes on! More complete technical specifications for all of the Buells, and many other top sport bikes, can be found in the "Sport Motorcycle Comparison Chart," on my Travel page. The only area that needs improvement, to make the Thunderbolt a decent touring bike, is rider protection. The factory supplied windshield is pure sport bike. Combined with the smallish fairing, it offers good protection for the torso, none for the hands, and directs the slipstream coming over the windshield about at the chinbar of the rider's helmet. This is tolerable on a Sunday sport ride, but fatiguing on a long freeway ride. I fitted a Rifle brand replacement windshield 17 inches tall (the only aftermarket replacement I could find) and while this represents a marginal improvement, it is far from ideal. The factory windshield is very short, about 13 inches, and angled at what appears to be less than 45 degrees above the horizontal. The Rifle replacement is angled almost bolt upright, and still too low. The wind collapses behind and around this windshield, and hits the rider in the face and shoulders. It is marginally better than the factory windshield, in that you are being hit in the face by broken air (I believe the aerodynamic term is "burble"), rather than the almost laminar airflow off the factory windshield. Faint praise, to be sure, since at speed the rider's head is still continually buffeted by the wind. If I lay over the tank, the Rifle windshield provides excellent protection--but who wants to ride a long distance laying over the tank? What is needed is a windshield taller than the Rifle version by about 5 inches, and angled back at about 60 degrees. This would put it somewhere between the excessively upright stance of the Rifle windshield, and the very swept-back angle of the factory windshield, and hopefully it would send the slipstream over the rider's head. Certainly a competent designer, with a little practice, could produce a satisfactory touring windshield for the Thunderbolt fairing. It has been done for plenty of other motorcycles. It is no secret that Buell motorcycles have had something of a "kit bike" reputation. After all, Eric Buell originally started building them in his garage. (Bill Harley and the Davidson brothers started the same way, back in 1903.) Everyone agreed that they were a blast to ride, but niggling problems like cracks in ultra light body parts, excessive heat radiating from the engine and exhaust pipes, broken engine mounts, uncomfortable seats, saddle bag latches that didn't work, and similar problems have drawn criticism, and rightly so. The 1999 models are the first since Harley-Davidson acquired 98% of Buell American Motorcycles. Eric Buell remains in charge, and still owns 2% of the stock. Harley had previously owned half of the company, with Buell owning the other half. The changes allowed by Harley's deep pockets are apparent. Everything has been improved, including the frame, engine mounts, fuel injection, front forks, swingarm, rear monoshock, seat, handlebar controls, the S-3 fairing, the S3 saddlebags, and more. Unfortunately, work remains to be done to eliminate the small, niggling problems to which the bikes are still prone. Judging by my experience with the S3, build quality still does not appear to be as good as a Harley-Davidson. In fact, it is probably below that of an average Japanese motorcycle, not really bad, but not perfect. There is no assembly line at the Buell factory. Each motorcycle is built individually, by a small team of workers, who work only on that particular bike until it is finished. This system yields great job satisfaction, high employee morale, a lot of promise for the future, and motorcycles that are maybe a little less uniform than they might otherwise be. Before founding Buell American Motorcycles, Eric Buell worked as an engineer for Harley-Davidson. Based on what I have read about Eric Buell, the most basic ingredients of his design philosophy seem to be centralization of mass, low unsprung weight, and frame rigidity. Let's take a quick look at these concepts, because they are central to why a Buell is so much fun to ride. I am no engineer, but as a sailor I am familiar with the benefits of mass centralization. A boat designed with the weight concentrated in the center, instead of out at the ends, will respond more quickly. It will tend to ride over, rather than plow through, the waves. Two people with access to a small skiff, dinghy, or rowboat can experiment with this concept. First, have one person sit in the very bow, and the other at the stern. Note how the boat feels sluggish and responds slowly to the waves. Now move both people (the mass) to the middle of the boat. Suddenly it feels more lively, and responds faster, now that the mass is centralized. The same basic principle also holds true for motorcycles. This is why Buell concentrates the weight of the heavy components of the motorcycle, the engine/transmission, muffler, gas tank, rear monoshock, and battery near the center of the motorcycle. Everything is basically placed above or below the engine/transmission unit, the heaviest single component of the motorcycle. The result is that Buell motorcycles feel exceptionally lively, and a lively motorcycle is more fun to ride. Unsprung weight is the weight of the components not supported by the suspension, principally the wheels, tires, lower fork legs, and brakes. Lower unsprung weight allows the tires to maintain better contact with the uneven surface of the road, thus making for a safer, better controlled, and more enjoyable ride. Buell uses hollow 3-spoke alloy wheels of the lightest and most rigid type for all of their models. For the Thunderbolt, Buell uses expensive Showa inverted front forks. Inverted forks put the smaller diameter fork section on the bottom, which lowers unsprung weight. They are also extremely strong, and more rigid than conventional telescopic forks. 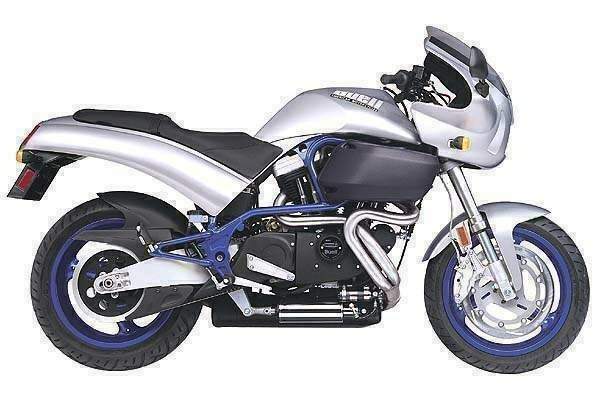 Going further to eliminate as much unsprung weight as possible, the Thunderbolt has a single stainless steel floating front brake disc, rather than the dual discs found on almost all other specialty sport bikes. Brake discs and their associated calipers are very heavy. To ensure adequate swept area, that single disc is the largest found on any production bike, 340mm in diameter. To make it lightweight while retaining the necessary thickness in cross section, it is extremely narrow in profile, and to ensure an excess of stopping power, the Thunderbolt comes with a 6-piston front brake caliper. "Stoppies" are easy on a Buell. Other premium motorcycle manufacturers can and do take some of these same steps to lower unsprung weight, but none combine all of these strategies as Buell does. Almost everyone agrees that a rigid frame is crucial to precise handling and control. Buell selected the expensive but effective method of using chrome-moly alloy steel tubing to build a perimeter frame with triangulated sections. Buell calls it a "geodesic perimeter frame." In the best modern fashion, the engine serves as a stressed member of the frame. The result is an exceptionally light and stiff frame, which improves handling and control. A bike that handles precisely and delivers exceptional control is more fun to ride. The centralized mass, low unsprung weight , stiff frame, and premium suspension, when combined with a rather short 55 inch wheelbase and only 24.5 degrees of front-end rake, should result in a light and quick handling motorcycle, and indeed it does. You might think the same combination would also make for a twitchy feeling motorcycle, but it doesn't. I expected, and found, a fast handling bike, but what I found most surprising was the Thunderbolt's excellent static stability. Static stability means that left to its own devices, it will run straight. This is a bike that will run straight as a die with the rider's hands off the handlebar. I guess the 3.8 inches of trail has something to do with that. Whatever the reason, the bike responds quickly, handles superbly, and runs true. Of course, more than trick engineering is necessary to build a complete motorcycle. The motor is the key to performance, and all Buells use a highly modified Harley-Davidson Sportster V-twin engine. The hot-rodded 1203cc "Thunderstorm" power plant used in the Thunderbolt produces an ample 101 horsepower at the crankshaft, and a gut wrenching 90 ft. lbs. of torque. This translates to about 71-78 ft. lbs. of torque and 85-90 hp. at the rear wheel, depending on whose dyno you read. Remember that horsepower is a measurement of work performed over time, and torque is the turning force at the crankshaft (or rear wheel). This is why torque is more important in everyday riding. Torque is what is responsible for that slingshot feeling when you roll the throttle on, not to mention those "power" wheelies. The vibration produced by the compact 45 degree V-twin motor is isolated from the frame, and the rider, by Buell's proprietary "Uniplanar" mounting system. This system works. It is amazing to ride a bike, powered by what is basically a Sportster 1200 engine, that is so smooth. At idle it feels about like a Sportster, but as the RPM increases, vibration diminishes. By the time the tach has moved past 3000 RPM, vibration is almost completely absent. The Sportster, as I wrote in my article "The Harley-Davidson Sportster," is quite pleasant to ride below about 60 MPH (in 5th gear). But vibration intrudes as speeds increase, and becomes uncomfortable (to me) by about 70 MPH. But on its cousin, the Buell Thunderbolt, the faster you go the smoother it gets. At 70 MPH and above, it is uncannily smooth. It is hard to believe it is powered by a Sportster 1200 motor, let alone one producing about a third more power. It seems to me that the Thunderbolt is a pretty good sport-touring bike, by which I mean a great sport bike for Sunday rides, with its power and razor sharp handling, that still has the capability of making overnight and longer trips. It has the range, speed, smoothness, stability, comfortable seating position, and available luggage to serve as a solo touring bike, plus the benefit of a very extensive dealer network should something go wrong while on the road (a good point to consider before purchasing some exotic brand sport-touring bike). Rider protection is the primary deficiency at present, but all it needs is a properly designed touring windshield to bring it up to snuff in that area. I hope that someone, either at Buell or in the aftermarket, will eventually respond to fill this need. If you want a sporty looking motorcycle for cheap transportation, there are more economical alternatives. But if you're leaning toward a sport or sport-touring bike, and ride for the pleasure of the experience, you owe it to yourself to at least test ride a Buell Thunderbolt.